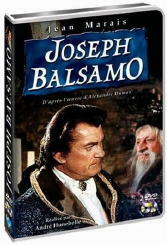 A Review by Dan Stumpf: ALEXANDRE DUMAS, p�re – Joseph Balsamo. By the way, Small’s movie (Black Magic, in the previous post) opens with a framing sequence of Dumas p�re (Barry Kroeger) kvetching to Dumas fils (Raymond Burr!) about how hard it is to write a book about Cagliostro and the Queen’s Necklace. Well, it just so happened I had that book on my TBR shelf, so I took it down and read Dumas’s 1843 thriller Joseph Balsamo. It’s quite good, actually, Better, I think, than the ballyhooed The Last Cavalier. Balsamo creates up an intriguing cast of characters — most of them figures from history — sets them at odds against each other, then lets them develop real personalities. The result is pleasant melodrama and fascinating history. There’s an extended sub-plot-line of Madame DuBarry getting herself formally presented at court over the objections of Marie Antoinette that I found more exciting than any of the sword-fights and tiger hunts in Cavalier. And Dumas’ portrait of Louis XV (That “martyr to boredom” whose dimness and self-absorption were equaled in modern times only by George W. Bush) is humorous, unflinching, and oddly engaging. Unfortunately, as I got further and further into the 575 pages that make up this tome, I began to realize not much was happening with Cagliostro and the Queen’s Necklace. And as I got towards the end, I found Joseph Balsamo was only one of four hefty volumes Dumas spent spinning out this tale. I’ve said it before: when I read a book, I want to read a book; not make a down-payment on a mortgage. So you can well imagine my disappointment. Still, the writing here was good enough, the characters real enough, that I might try another installment…. Dan, if you don’t mind reading online, the Dumas books can be found as free e-books at Project Gutenberg, Manybooks, Munseys and others in multiple formats. It’s certainly a cheaper way to find sometimes rare and pricy books. Memoirs of a Physician is sometimes broken into two volumes, followed by Balsamo, and The Queen’s Necklace (the latter no relation to the movie of that name save in subject, but also a Classic Illustrated comic beautifully drawn by Gray Morrow). Memoirs has a terrific opening with Balsamo attending a meeting of a secret society on a wild mountain top. Dumas at his best. I agree to some extent about The Last Cavalier, however its more important as a lost novel. At least it didn’t have that ‘African rattlesnake’ that appears in Georges (another ‘lost’ novel). David Vineyard starts off his comment “…if you don’t mind reading online…”. I’ve found the internet to be very useful in obtaining information and I often google for articles, facts, information. However, as far as fiction is concerned, I have found it is simply not enjoyable at all to read a long short story or novel online. After a couple pages, I find myself skimming faster and faster in order to end the uncomfortable situation. I know an entire generation is growing up that likes to read online and avoids the book format but I really question as to how much enjoyment they get out of reading a mystery or detective novel online. After all the book has been with us now for over 500 years and it still is the best format and way to read as far as convenience and enjoyability. And collecting first edition books, old paperbacks, and pulps is still alot more fun than reading online, not to mention the value and worth of your collection. Walker, I much prefer a book in hand, but there are hundreds of books I’ve been able to read on line that I could never find, much less afford, otherwise. Still, I know many people who simply hate to read on line, though there are a few good formats that do their best to transform the process as close to reading a book as possible with options for page colors, columns, and text size. Some of them even reprint the illustrations that accompany the text. Best of all they are free downloads. But that said, nothing will ever replace a genuine book in your hand. But again, if you don’t mind reading online and want to save the money buying some of these works would cost, or even to preview one before investing the numerous sites offering free e-books are worth your time. For my money the best e-book readers are Mobipocket and Y-Book, the latter the creation of an Australian science fiction writer, and designed to look as close to a paperback as possible. Both are free and easy to use. You can even download a program for Y-Book that allows your computer to read the book to you, though the pronunciation can be a riot (such as pronouncing the e in one or wind as wind as in wind up doll). And there is a wide variety of material available from Gold Medal paperbacks by Dan Marlowe to Ed Lacy, and rare material from the pulps. I’ll grant though if you aren’t using a laptop it is probably not half as easy to enjoy the experience. But I’ll never turn down freebooks in any format I can read, and at least unlike micro film or micro fiche the computer screen doesn’t give me a raging headache. There are times and places for almost everything, and that includes Kindles and e-readers of any make or model — long trips away from home, for example — but that doesn’t mean that I’m going to buy one. I’m with Walker. I need paper in my hand, and reading fiction from a screen is a necessity that I simply don’t need. I’m glad that so many out-of-print books are being digitalized, but unless I can get a printout, more than likely I’m going to pass them by. The next generation of readers? It’s their choice. I’ve made mine. Steve, I fully grant your and Walker’s points. But, again, there are books available in e-book formats I either could never hope to find or afford if I did find them, and this is an opportunity to read them in a format where I can adjust the print size to my personal comfort level and have at hand with no investment and no space — save the electronic kind. I’ll admit it took me a while to get used to it, but now I don’t notice the difference, and thanks to this I’ve found everything from Carroll John Daly’s Race Williams and Satan Hall, to the two Norbert Davis Cartairs and Doan mysteries I was missing to rare books by Dumas and M.P. Shiel’s classic Yellow Peril novel Yellow Danger. You can read several of the Lone Wolf novels by Joseph Louis Vance, Arsene Lupin by Le Blanc, all the Philo Vance and Charlie Chan titles, and a good deal more. Yes, I’d rather have the book, and in some cases do have it. But I can read an e-book without fear of crumbling pages or decreasing value. All I’m saying is that for those of us who don’t mind reading online and who have books we have searched for many years it’s a Godsend. I managed to download the infamous unauthorised James Bond novel The Killing Zone by Jim Hatfield for free when the cheapest edtion I’ve ever seen on sale (and only once in 20 years) was $35. I’m pretty sure if I had paid that for a paperback in dubious condition I would have enjoyed reading it a good deal less. If you don’t mind the format there are rarities out there, but you are right it is far from an ideal reading format. Even the best Kindle or whatever can hardly replicate reading a real book, and at $300 there is no real savings. But if you already have a computer you can download a free ebook reader that supports multiple formats and find everything from classics to classic junk. I’ll just put it this way. If I had had this available in High School I would never have had to buy that blasted copy of Silas Marner. But that said I have no argument with you or Walker, save that there are books I have downloaded for free that I looked for a good twenty years and only found in expensive editions if at all. For me just getting to read some of these is enough even if I’d prefer to have the original or a reprint in the form of a real book. At worst you can always read the book online enough to see if you want to buy it before actually committing any money. That alone makes it worth while. Of course David has a valid point and I guess this also points out the main difference between the reader and the reader/collector. The reader is happy to get any format in order to read the book but the collector actually wants the original book, first edition, old paperback, pulp magazine. By that I mean, the new generation of readers are used to online reading and have very little interest in collecting and reading the original book or magazine. For instance, before email, many people saved correspondence, now most just delete emails. What does this mean for the future of book and magazine collecting, not to mention collections of correspondence, etc. Walker makes good points, and as he surmises I am a reader/collector, but even I had to face at some point that some books were (gasp) disposable simply in order to survive the deluge and not be buried in paper. Online reading has been a boon and a threat, but I think the book will survive. The Harry Potter thing may be over, but the long lines at bookstores at midnight when the books came out proved there are still young people out there who crave physical books. Reading online is a supplement for me, and a way to afford books I just could not buy. I was able to buy electronic versions of some Carroll John Daly books I had wanted for years for as little as $3.95 when the actual book — if I could find it — would run $15 to $50. And there are a tremendous amount of free books available. Google books even has some rare books from Oxford’s Bodelian library — books I would have to travel overseas to even look at otherwise. That said, there is still more that isn’t available than is, and I don’t think book collecting is in any real danger. Home video didn’t kill off movies anymore than television did, and while television did kill off radio drama, the radio medium survives. The book, like Mark Twain, is being buried prematurely. I don’t think Gutenberg will be forgotten any time soon, and it may actually be good for readers and writers in the long run to have a new market. I know a handful of writers who are self publishing, who, much as they would like to have their books in print, have found that ebooks combined with print on demand has allowed them to get a toe-hold and interest publishers in their books much the way sales to the pulps, slicks, and digests once aided writers in the past. As much as anything the Internet has given young writers a place to be bad and learn their craft — something that has been missing since the heyday of the softcore paperback market of the early sixties and the men’s action market of the seventies and eighties. I only got back into writing last year and made my first sale in three days where normally the process would have taken six weeks at the least. Don’t get me wrong. I am barely computer literate, and I rage at the thing more often than I praise it, but for some of us it has been a boon. I have to be honest that there are a few books in my collection that simply would not be there if I had been able to preview them before actually spending money — for instance my Fergus Hume and Herbert Adams collections. I’ve found dull books much more enjoyable when I haven’t paid $10 for them.